Environmental groups Nature & Youth and Greenpeace argue that Barents Sea oil must remain in ground if Norway should fulfill its Paris climate deal obligations. The lawsuit was delivered to the Oslo District Court Tuesday morning and announced at a following live-broadcasted press-conference. “I’m standing here on behalf of 7,000 Nature & Youth members, on behalf of youth from around the world that are worried about the future,” says Ingrid Skjoldvær, Head of Nature & Youth. “Climate change is really dangerous, it is really unfair, and it is happening now,” she continues. “The Norwegian government has actively violated the Norwegian Constitution on protecting the citizens of the country. Most of the oil have to remain in the ground, but the Norwegian Government has choosen to close its eyes and are pretending that the Paris agreement never happened,” Skjoldvær argues. With backing from well-prepared lawyers, the environmentalists claim that oil extraction in the Barents Sea is irreconcilable with the maximum two degrees Celsius increase in global temperatures. The Intergovernmental Panel on Climate Change (IPCC) has concluded that global warming of over two degrees Celsius compared with pre-industrial levels will lead to a high risk of triggering mass species extinction, widespread ecosystem collapse, and the destruction of the livelihoods of hundreds of millions of people. Amended two years ago, the Constitution’s Arctic 112 is aimed to ensure the State has an obligation to take measures guaranteeing the citizens’ rights to a secure climate, including for the descendants. “We will argue in court that we must take action to keep the Paris climate agreement on track, and we will invoke Norway’s constitutional right to a healthy and safe environment for future generations,” says Head of Greenpeace Norway Truls Gulowsen. “New oilfield is mindless and unlawful. Therefore, we take the Norwegian Government to court for opening new oil fields in the Arctic. We are doing this on behalf of a broad movement,” Truls Gulowsen says. The lawsuit, translated to English and made available online, reads that Norway’s petroleum production Licensing Decision will have serious environmental repercussions. 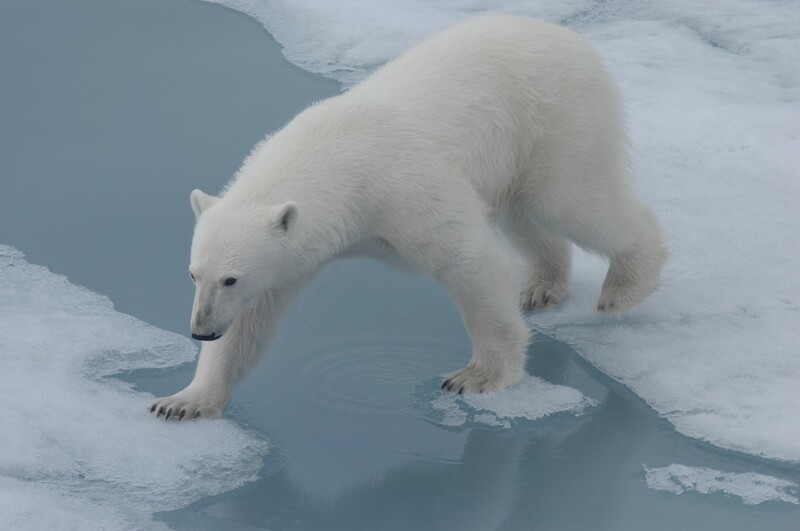 Arctic sea ice is melting and the polar bear finds it harder to hunt for seals. Last year, the Norwegian Government opened 57 new ‘blocks’ of petroleum exploration acreage in waters that stretch to the edge of the Arctic sea ice in a process known as the ‘23rd licensing round.’ In May 2016, these blocks were allocated to operators that have applied for exploration permits in the Barents Sea. Statoil has already announced a major Barents Sea drilling campaign in 2017. Drillings will take place at different locations, including a new test-well at Goliat field, where Statoil partners with ENI Norge at the only oil-field in production in the Norwegian sector of the Barents Sea. Another drilling for 2017 will take place at the Korpfjell formation near Norway’s maritime border to Russia. The Korpfjell formation will be one of the northernmost drillings ever made in Norwegian Arctic waters. In August this year, the Government announced yet another licensing round. “Awarding prospective exploration acreage is a central element in order to maintain employment, activity and high value creation. This is particularly important in the present situation with weaker employment figures in the petroleum industry and related industries,” Minister of Petroleum and Energy, Tord Lien, said when announcing the 24th licensing round. Many of the new areas to be open for test-drilling are in the eastern and northern part of the Norwegian sector of the Barents Sea. The lawsuit by the environmental organizations is already backed by citizens groups and individuals from around the globe, Ingrid Skjoldvær with Nature and Youth could tell at the press-conference. “Statements of solidarity and offers of help have come from around the world, including from scientists, lawyers and activists,” the Norwegian ecological groups announce. Some 200 Norwegian cultural figures have signed the petition calling to stop the 23rd licensing round, especially those fields close to the Arctic ice-edge in the Barents Sea. The list includes author of Sophie’s World, Jostein Gaarder, who also participated when the lawsuit was announced in Oslo on Tuesday.